This blog presents one of the many stories Tom Henry told me in our prison cell. The Tom Henry manuscript, which began at 1,100 pages, has now shrunk to 370, and this story was lost to the cutting, but it’s a good one. Enjoy! “I was in a tree stand, watching the deer hunters walk through a field toward me. You climb a tree so the deer can’t smell or see you there – they don’t look up. I was point man for the hunting party. Ten men in a line were making a drive. They were walking slowly, about fifty yards apart, so I had time to watch the fox and still keep my eye peeled for deer. “While I was waiting, I spotted a red fox by the creek. I brought my gun up to watch him through the scope. I could see the hunters by naked eye. “That fox picked up a piece of driftwood, I’d say two inches around and fourteen inches long, and grabbed one end of the stick between his teeth. He backed into the water up to his hips and stayed in that position a few minutes. He backed up a little more, so his mid body was in the water, and held still. “What could he be doing? I had the scope up to 9X. He backed up to his shoulders, and paused, then he backed up to his chin, and waited, and then he swam out into the water, letting himself float with the current. Then his head disappeared, and all you could see was the stick pointing straight downstream, and finally he let go of it. It floated downstream while he dog-paddled to the shore, shook himself, and walked away. “For months I wondered about that red fox with the stick in the creek. I’ve shot a lot of foxes with ticks and fleas in their fur and I’ve noticed, when I put a fox hide in water, they all came up out of the hair. “That red fox must have had fleas and, by backing into the water, he slowly got them onto the stick and then he got rid of them. Thank you for reading my blog. I hope you visit often. 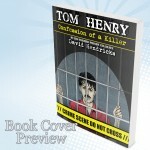 My upcoming book, Tom Henry: Confession of a Killer, will be e-published in September. Great story…thanks for sharing it. Can’t wait to read the book. Heartwarming application! And yes, as Paula said, John repeated that story many times! Thank you both for liking this story. Now I’m kind of sorry I cut it. But, to get 1,100 pages to 370, something’s got to go! I’m sure there’ll be more excised anecdotes in future blogs.